China’s inaugural Chang’e-3 lunar lander has snapped the missions first panoramic view of the touchdown spot at Mare Imbrium. Chinese space officials have now released the dramatic surface imagery captured by the Chang’e-3 mothership on Dec. 15, via a video news report on CCTV. To make it easier to see and sense ‘the new view from the Moon’, we have created screen shots from the rather low resolution TV broadcast and assembled them into a photo mosaic of the landing site – see above and below mosaics by Marco Di Lorenzo and Ken Kremer. The Chang’e-3 mothership imaged the stark lunar terrain surrounding the spacecraft after the ‘Yutu’ rover perched atop successfully drove all six wheels onto the moon’s surface on Dec. 15, barely 7 hours after the momentous landing on Dec. 14. The individual images were taken by three cameras positioned around the robotic lander. Chinese scientists then pieced them together to form the lander’s first panoramic view of the lunar surface, according to CCTV. The panoramic view shows ‘Yutu’ and its wheel tracks cutting a semi circular path at least several centimeters deep into the loose lunar regolith at the landing site at Mare Imbrium, located near the Bay of Rainbows. A significant sized crater, several meters wide, is seen off to the left of Yutu and located only about 10 meters away from the Chang’e-3 lander. Several more craters are visible in the pockmarked surface around the lander. Mission leaders purposely equipped the lander with terrain recognition radar and software so that it could steer clear of hazards like craters and large boulders and find a safe spot to land. Indeed just prior to touchdown, the lander actually hovered at an altitude of 100 meters for about 20 seconds to avoid the craters and rock fields which could have doomed the mission in its final moments. See the dramatic Chang’e-3 landing video in my earlier report – here. This screen shot from one photo of many of the moons surface snapped by the on-board descent imaging camera of the Chinese lunar probe Chang’e-3 on Dec. 14, 2013 shows the probe approaching the Montes Recti mountain ridge and approximate location of the landing site. This marks the first time that China has sent a spacecraft to soft land on the surface of an extraterrestrial body. Credit: Xinhua/CCTV/post processing and annotations Marco Di Lorenzo /Ken Kremer. The 140 kilogram Yutu rover then turned around so that the lander and rover could obtain their first portraits of one another. “The rover reached the point of X after it went down from the lander, then it established contact with the ground. Then it went to point A, where the rover and lander took pictures of each other. 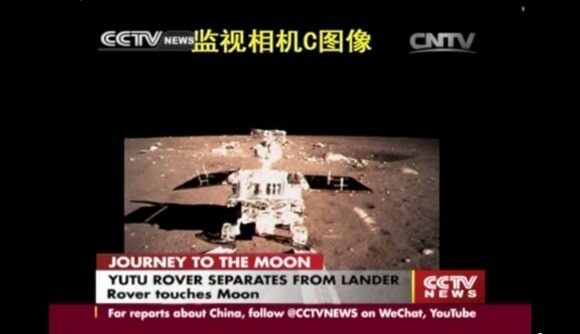 Then it reached point B, where it’s standing now.” said Liu Jianjun, Deputy Chief Designer, Chang’E-3 Ground System, to CCTV. Chinese President Xi Jinping and space agency leaders have hailed the Chang’e-3 mission as a complete success for China. The Yutu rover, which translates as ‘Jade Rabbit’ will use its science instruments to survey the moon’s geological structure and composition on a minimum three month mission to locate the moon’s natural resources for use by potential future Chinese astronauts. 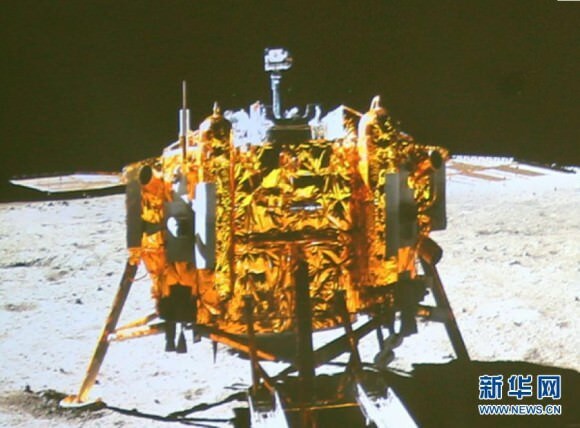 The lander will conduct in-situ exploration at the landing site for at least one year, say Chinese officials. Hopefully, China will quickly start releasing full resolution imagery and video taken by the Chang’e-3 lander and Yutu rover at a dedicated mission website, like NASA does, rather than issuing photos of imagery from projection screens and televisions – so that we all can grasp the full beauty of their tremendous lunar feat. The final Full Moon of 2013 occurs tonight, and along with it comes something special: the most distant and visually smallest Full Moon of 2013. Why doesn’t the annual “mini-moon” receive the same fanfare and hype that the yearly perigee – or do you say Proxigean to be uber-obscure – “supermoon” does? The smallest Full Moon of the year does appear to have a public relations problem in this regard. But as you’ll see, the circumstances for this week’s Full Moon are no less fascinating. The exact timing of tonight’s Full Moon occurs at 4:28 AM EST/9:28 Universal Time (UT) on Tuesday, December 17th. This occurs just two days and 14 hours prior to the Moon reaching apogee on December 19th at 6:50PM EST/23:50 UT at 406,267 kilometres distant. This is one of the three most distant apogees of 2013, and the closest to Full for the year. It’s also with 500 kilometres of the most distant apogee than can occur, as the Moon’s apogee can vary between ~404,000 and 406,700 kilometres distant. Tonight’s Full Moon will have an apparent angular diameter of around 29.8’ arc minutes, just a shade lower than the usual value quoted of around half a degree or 30’. The visual size of the Moon as seen from the Earth varies about 12% from 34.1’ to 29.3’. Also, the Moon is also about half an Earth radius more distant when it’s on the local horizon versus at the zenith overhead! This is also the closest Full Moon to the December solstice, which occurs four days later on Saturday, December 21st at 12:11 PM EST/17:11 UT. This marks the start of astronomical summer in the southern hemisphere and the beginning of the winter season in the north. Think of tonight’s Full Moon as a sort of “placeholder,” marking the point at which the Sun will occupy during the June solstice on the Gemini-Taurus border. This all means that tonight’s Full Moon rides high for northern hemisphere residents towards local midnight. But the “Long Night’s Moon” of 2013 is rather lackluster in terms of declination. While it’s the northernmost Full Moon of 2013 at a declination of +18.7 degrees, it’s a far cry from the maximum declination of +28.72 degrees (the angle of the ecliptic plus the tilt of the Moon’s orbit) that it can achieve. This only occurs every 18.6 years and last occurred in 2006 and will happen again around 2025. We’re currently headed towards a shallow minimum for the Moon’s orbit in 2015. Ancient European and Native American cultures both knew of this cycle of high-flying moons. Not weird enough? The next “most distant Full Moon of the Year” happens only one lunation later on January 16th… within just 2 hours of apogee! Perhaps January’s Full Moon is due notoriety as a “Super-Mini Moon?” Such a pairing of “mini-moons” last occurred on 2004-2005 and will next occur on 2021-2022. The Moon also visits some other celestial sights this week. After passing five degrees north of Jupiter on December 19th, the Moon heads towards an occultation of the open cluster M67 in the constellation Cancer on December 21st for northern North America. Though the Moon will be waning gibbous, it might just be possible to note the reappearance of the cluster on the Moon’s dark limb. Other occultations for the remainder of December by the Moon include an occultation of Spica on December 27th for northern Asia, Saturn on December 29th for Antarctica, and +3.6th magnitude star Lambda Geminorum for Canada on December 18th. The passing of the Full Moon also means it will be entering into the morning sky, which also means bad news for viewers of the Ursid meteor shower which peaks on December 22nd and hunters of Comet C/2013 R1 Lovejoy, currently shining at +5th magnitude in the constellation Hercules low in the dawn. Moon crossing Orion this week. (Credit: Stellarium). The keen-eyed may notice the Moon also transits through the northern end of the non-zodiacal constellation of Orion on Tuesday, December 17th. Did you know that the Moon can actually stray far enough away from the ecliptic to cross through 18 constellations? The Six non-zodiacal constellations it can transit are: Orion, Ophiuchus, Corvus, Sextans, Auriga and Cetus. Other names for the December Full Moon include the Yule, Oak, and Cold Moon. Finally, a new Earthly ambassador is now roaming the lunar surface. Finding the landing site of Chang’e-3. Photos and graphics by author. 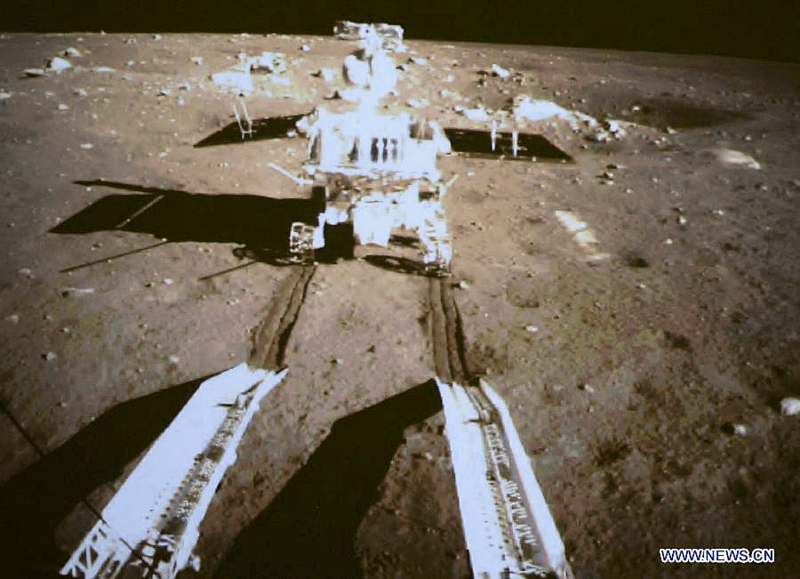 China’s Yutu or “Jade Rabbit” rover has been beaming back some splendid images of the lunar surface! So don’t let the cold temperatures deter you from exploring the lunar surface, and the strange but fascinating motions of our nearest natural celestial neighbor. Dress warm and be sure this Christmas season to raise a glass of ye ole Nog to the Solstice/Yule Moon.